A fun and versatile way to utilize vertical space for storage is to organize with pegboards. Pegboards work well for organizing a wide variety of stuff in just about any room of the house. These organizational wonders come in metal, tempered wood and even plastic. Accessories include a plethora of hooks, baskets, bins and shelves. Try incorporating a pegboard into your organizational scheme. With a little imagination you can literally use pegboards to organize just about every room of the house. Here are a few clever ideas from around the web to inspire you. 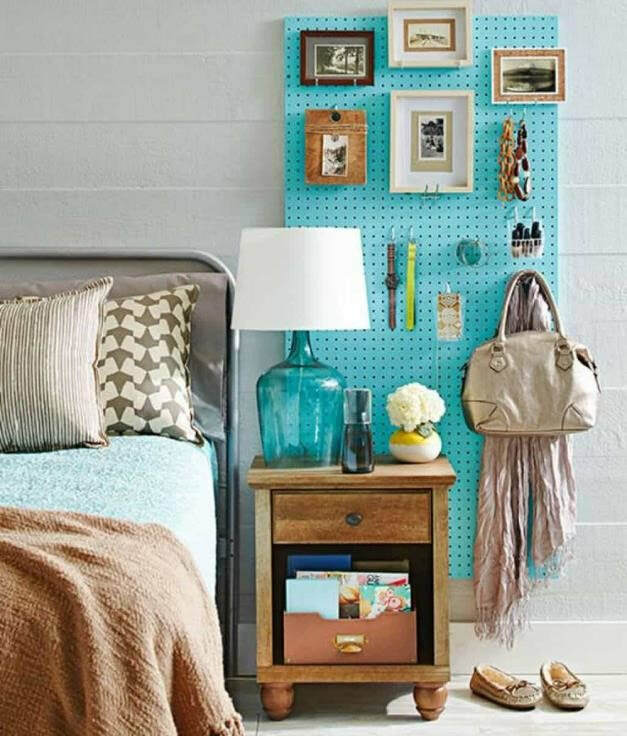 Pegboards make utilitarian headboards from which you can hang decorative items as well as the essentials such as a reading light, an alarm clock, a shelf for a book, and much more. The pegboard above isn't really a headboard, and it isn't a side table. It's just a cool way to add a splash of color and some extra storage and display space in the bedroom. Pegboards can be particularly useful storage solutions in children's rooms. Use them to store clothing (including dress up), hats, toys, artwork, and even books (attach a wire basket). A great way to free up counter space in the kitchen is to incorporate a pegboard somewhere. 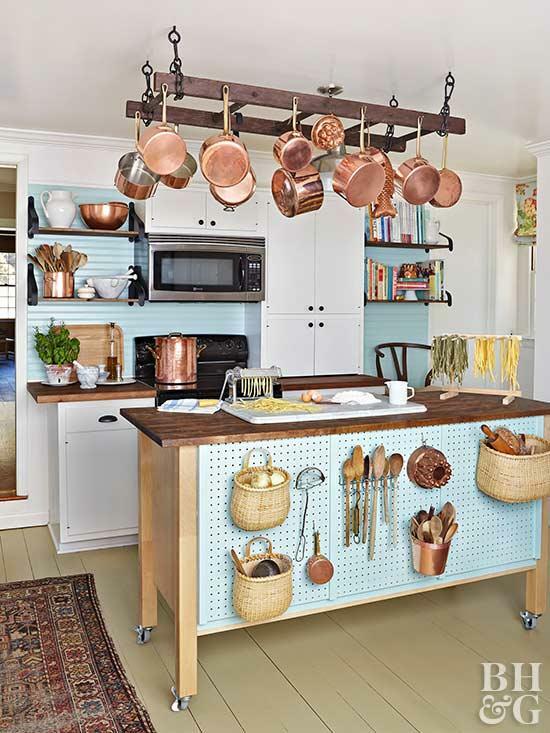 Many kitchen tools lend themselves nicely to hanging, making pegboards a great option in the kitchen. As shown above, a pegboard can provide a ton of extra storage in a small kitchen. An added bonus is the accessibility a pegboard provides, making it easy to see and retrieve whatever it is you need. Attach a pegboard to the front or side of a kitchen island and transform it into functional storage space. Pretty baskets make excellent storage containers, as do copper or metal buckets and wire baskets. By carefully determining what and how items are displayed, your kitchen storage becomes part of your décor. Here's a really clever idea: fill a small gap in kitchen cabinetry with a pull-out pegboard. What better way to add much needed hanging space to a closet than to organize with pegboards! All those handy hooks are perfect for storing belts, bags, scarves, hats, jewelry and more. This four-sided portable tool caddy made from pegboard is a great example of functional construction. Look at all that lovely storage! Here's an example of a pegboard cabinet. The use of pegboard on the cabinet fronts allows for storage both inside and outside the cabinet. As you can see, imagination and creativity are the only limits to the ways in which you can organize with pegboards. Look for ways to incorporate these versatile organizational tools into your home.